Loneliness was there before he wrote it. In the vacant buildings, the downtown parking lots, the abandoned streets. It was there in the failing school system, the empty storefronts, the stagnant waters of the Providence River. For Devin Costa, loneliness was the feeling of a generation that woke up after a long American Dream to find they were sleeping on the sidewalk. “I’d just lost two friends to suicide from different towns,” Costa wrote in an artist’s statement for a recent exhibition at the Columbus Theater, “And in each town the general thought of the kids there was ‘another teen suicide.’ As if that was normal.” Over the past decade, teen suicide attempts in Rhode Island have doubled, according to Rhode Island Public Radio. It’s the third leading cause of death for men and women ages 15-24 in the United States. From several stories up, you can see just how small downtown is, as if you could reach out and embrace all of it. If it’s past the city’s bedtime, a peculiar silence swallows Providence, from the façade of the former National Bank on Weybosset Street to the steps of City Hall. The buildings seem to huddle closely around the so-called Superman Building, the city’s architectural icon, its offices vacant for years. A legacy of deindustrialization and economic decline has left Providence somewhat stripped, uncertain of what to do with all these former beehives of industry. “For people who work downtown, it’s unsettling. It gives it a sight like as if maybe there is some issues here,” Captain Michael Correia of the Providence Police told WPRI 12 Eyewitness News back in April. The campaign for the creative city places public art in the sphere of urban planning and development. In this urban model, art becomes a means to an end, a way of capitalizing on human resources and attracting investors or tourists to metropolitan centers. It’s no surprise that sanctioned street art often walks hand-in-hand with the drive for preservation. Certain walls are designated historic brick, while others become canvases for city-hopping muralists. As an instrument of gentrification, palatable street art lends a sense of authenticity to those who seek it—the creative class, a veritable mish-mash of entrepreneurs, designers, and artistic professionals. Public art moguls tend to favor the aesthetic of gritty urban life, while simply painting over local problems and avoiding provocative statements. 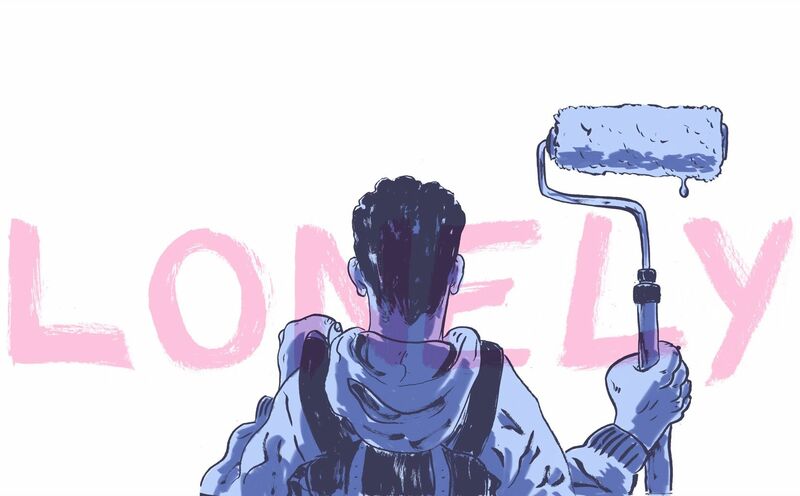 In the Creative Capital, there isn’t space for projects like LONELY. After graduating from RISD, Yarrow Thorne started the Avenue Concept in 2013 to create a sanctioned space for public art in Providence. “We were quickly approached by the city and the graffiti task force as a solution to some of their challenges,” Thorne recalled, sitting in the organization’s Lockwood Street office. The Avenue Concept would take heavily targeted walls and organize a sanctioned mural project to combat what Thorne calls ‘negative tagging.’ They’ve also commissioned artists to paint the dull concrete walls between Central and Classical High School, as well as large murals on Washington Street by Polish street artists Etam Cru and Natalia Rak. When marginalized voices are silenced or ignored, they often surface in subversive ways. LONELY confronted Providence with feelings of negativity in a way sanctioned public art installations rarely do. “I think art is being exploited in this city. They take who they want to take and they use it as a way to brand the city as a place where people that want an urban feeling would want to go,” said Costa. But in its plain block lettering, LONELY spelled out the problems of urban life. Alienation. Unemployment. Gentrification. Invisibility. LONELY couldn’t be commercialized or commodified. But it could be illegalized. In mid-April, the Providence Police Department put out a surveillance image of Costa descending a flight of stairs with a paint roller and a pan of his trademark pink paint. Still living with his family, Costa decided to turn himself in to the city instead of waiting for the police to raid the house. “What happens if we let you go tonight and then tomorrow you fall off a building and die,” asked one of the detectives who questioned Costa upon his arrest. “That would be tragic,” replied Costa’s lawyer, Thomas Thomasian. “Not for me. For me, it would just make my job easier,” the cop replied. For firstor second-time offenders, graffiti is a misdemeanor, but multiple offenders may face felony charges in Rhode Island. State Senator Maryellen Goodwin, who sponsored the current legislation, told the Woonsocket Call back in 2013, “it makes neighborhoods look run-down and uncared for, sending a message to others that it won’t matter if they decide to add more graffiti, litter or blight to the area.” This argument—the broken windows theory—states that the deterrence and heavy punishment of minor crimes fosters law and order, preventing major criminal activity. A recent Providence Journal editorial echoes Goodwin, arguing that downtown needs to be cleaned up: “the park, plaza, and steps have been invaded by people who cause problems, including those suffering from mental troubles and/or drug addiction.” In this sense, stigmatized individuals, already excluded from the conversation, are blamed for the lack of resources provided to them. And the graffiti artist is thought to bear the burden of a future murderer, who may decide that a tag suggests a good location for taking somebody’s life. This policy not only fails to eradicate serious crimes, but also leads to rampant racial discrimination. Costa chose to place LONELY in the most visible spaces, in the spaces that would provoke and antagonize authority: the Biltmore Garage, waterfront properties facing the East Side, and office buildings in the heart of downtown. “The idea of gentrification holds a lot of weight in this situation,” he said, “If you put graffiti in a neighborhood where it belongs—dilapidated or poorer people living there—the victim is discounted. They don’t really care what you see cause you don’t bring in as much money as these people.” In other words, cities selectively police graffiti, maintaining different standards for lowerand upperclass areas. In the Creative Capital, not everybody has the same chance to express themselves. Property owners, city government, and artistic entrepreneurs get to decide which art to sanction and what the restrictions are on certain projects, often silencing critical voices and avoiding difficult conversations. In the push to lure new residents and new capital, marginalized communities are often left out of the creative process in favor of affluent, well-educated urban transplants. In August, Costa pleaded no contest to six charges of vandalism and landed a grand total of $14,248 in fines and fees. Originally ordered by the court to pay monthly installments over two years, Costa recently received a letter reducing that time to one year. Per month, that’s equal to a forty-hour workweek on minimum wage. The arts community has rallied around LONELY, and an online fundraising campaign has already raised $4,000 over the past two months. Vida Mia Ruiz, who started the campaign, told the Independent, “Given our community’s overwhelmingly positive response to the tags, I figured we could organize to make sure the story didn’t end with silencing of a bright, motivated, and conscious voice with the threat of probation, home confinement or jail should he be unable to meet the deadline.” The campaign has brought Costa into contact with accomplished local artists Will Schaff and Brian Chippendale, who have helped him improve his screen-printing and stenciling techniques when he’s not working his two jobs to pay off his legal fees. In early November, Costa exhibited framed prints of his work at the Columbus Theater as a statement about how art changes once it’s presented in an official space. “I think that if you stop for a minute, what Devin’s trying to do is bring up a question in general. How lonely are we? How can we connect with other human beings? What a vulnerable thing to do,” Mary Beth Meehan told the Independent in a phone interview. As part of the International Arts Festival this past summer, Meehan exhibited large-scale photographic portraits of Providence residents on buildings throughout the city. One of Meehan’s photos, a picture of an Olneyville mechanic, hung right next to “Lonely as I’ve ever been,” on the façade of 32 Custom House Street, facing the river. Together, the two pieces—one commissioned, the other unsanctioned—filled up the formerly blank brick wall. While Meehan’s photo still stands, Costa’s message has been erased. Perhaps the most iconic LONELY piece still in place is on the South Street Power Station: “I love you even when you don’t notice.” The former power station—soon to be jointly redeveloped by Brown University, the University of Rhode Island, and Rhode Island College—overlooks I-195 and its new, superior replacement, the Manchester Street Power Station. Stripped of its smokestacks and turbines, the building embodies everything LONELY stands for: disposability, inadequacy, estrangement. If you’re looking up the mouth of the Providence River, Costa’s statement is set against the skyline, reading like a love letter to the city. Now, Costa is carrying LONELY further. After his exhibition at the Columbus Theater, he’s busy printing t-shirts and honing his skills in different artistic mediums. He still has a lingering sense of self-doubt and insecurity: “I struggle with what art is and I don’t really know if I’m an artist.” Over the past couple of months, some of Costa’s messages have been washed away, exposing the empty bricks beneath them. But despite the absence, you can see that LONELY is still there. BEN WILLIAMS B’16 is trying to overcome a fear of heights.